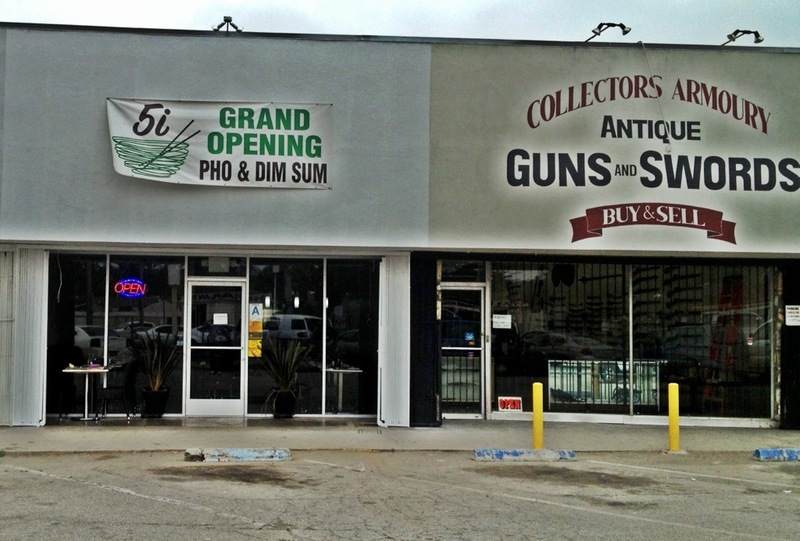 Next time you’re hitting up the Scarlet Lady Saloon or Roger’s Exciting Tattle-Tale Room, two of Culver City’s diviest of dive bars, you’ll have the option of eating Vietnamese food (or dim sum). 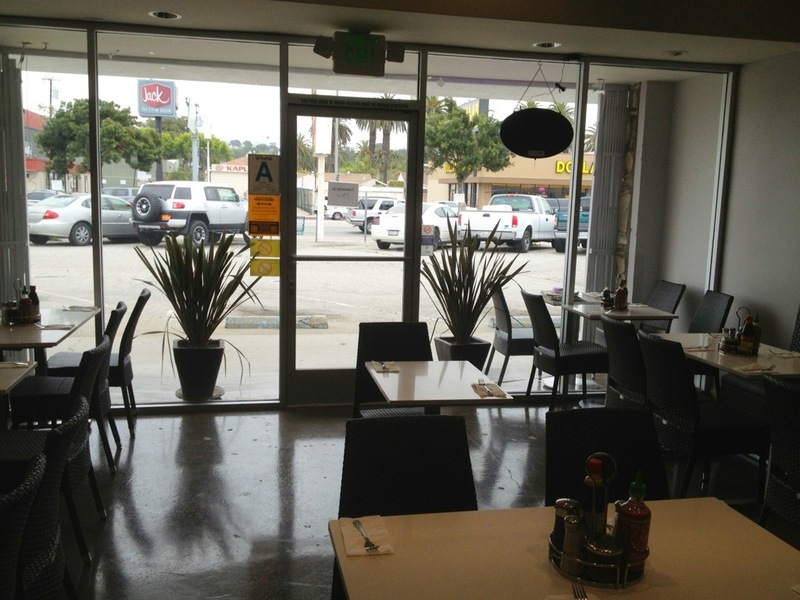 Does the Westside’s excitement about Nongla extend to Vietnamese newcomer 5i? Housed in a former vacuum repair shop, and in an old strip mall in Culver City that has the two wacky bars, an antique guns and swords shop (one of at least two such shops in Culver City), a pool supply store, and a toy store, 5i brings a bit of interestingness to one of the crappier food areas of Culver City. The best place to get something to eat for a half-mile or so is probably the surprisingly decent sandwiches at the deli counter at Pavilions. The interior is new and pretty non-descript. 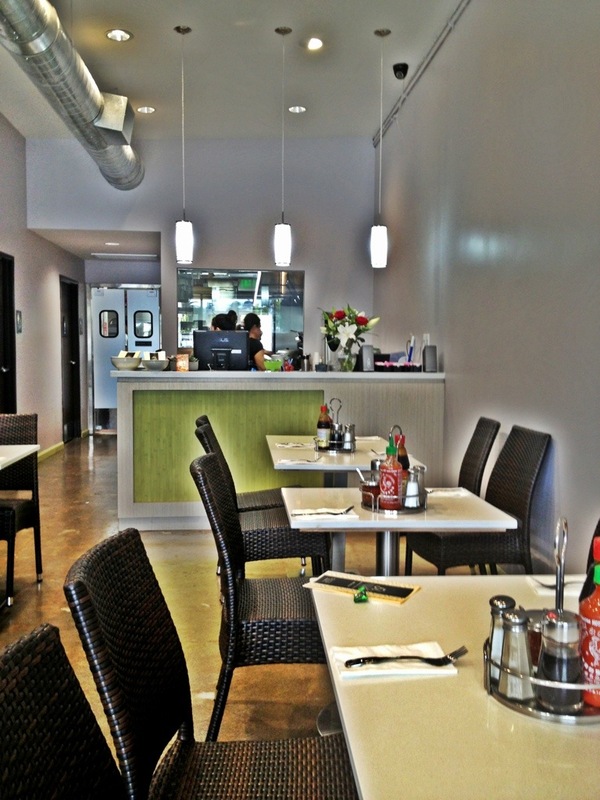 Bottles of Sriracha and hoisin sauces on each table give some comfort that the owners have at least been to a real pho shop. The menu below recalls the theme to Facts of Life (“You take the good, you take the bad, you take ’em both and there you have the facts of life – the facts of life.”). 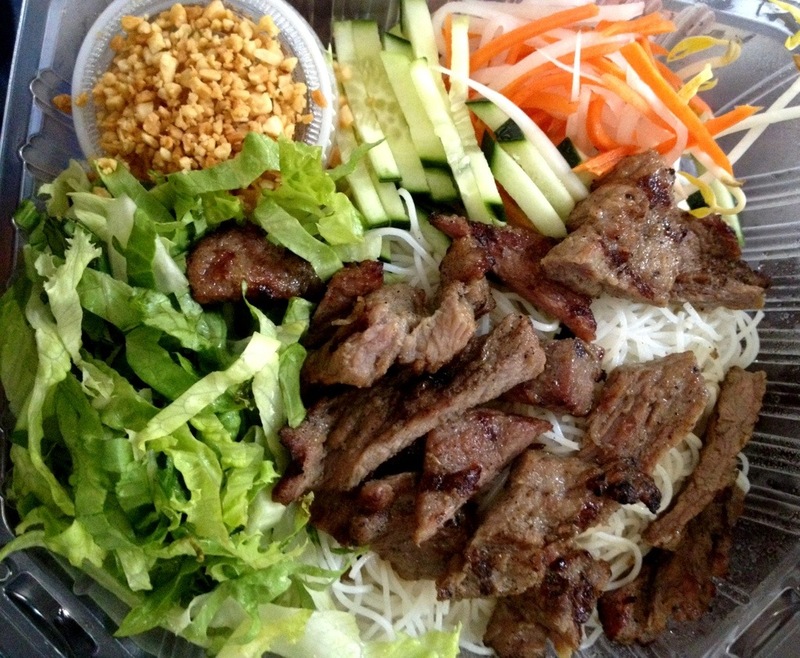 Alongside your pho (rare beef, meatballs, tripe, etc.) and bun (charbroiled pork or beef, no imperial rolls though), you have Chinese-ish food. They say they get the dim sum items made at a legit producer in El Monte (hmm . . .), but then the Chef’s Specials section leads off with orange chicken. I mean, come on, orange chicken? Fine, against my Fooddouche principles, I went ahead and ordered the rare beef pho and the charbroiled pork bun. Here’s the beef, pre-bath. The pho was pretty good. Nothing earth-shattering. But it was legit. They said the broth was the product of 8 hours of cooking. 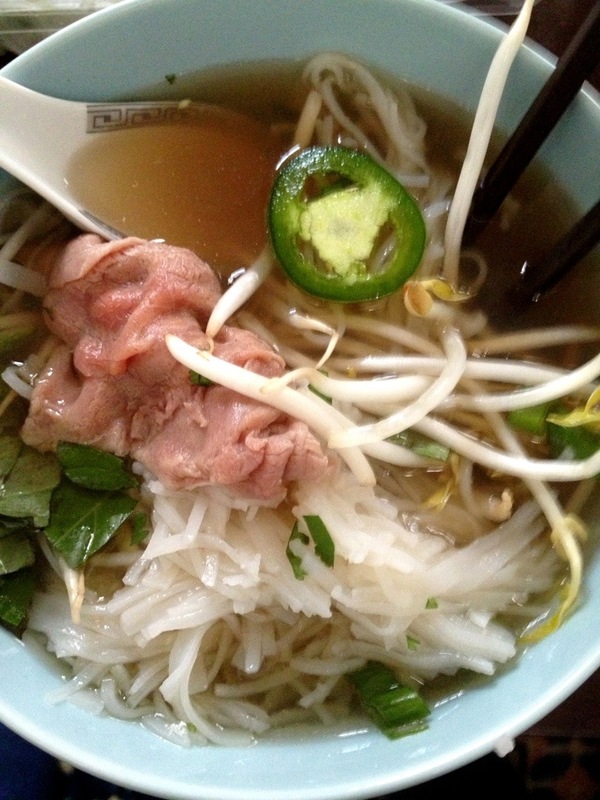 Bean sprouts, jalapeno slices, fresh basil – all fine. I had no complaints other than that it wasn’t the best I’ve ever had. I’d definitely order it again. The bun was also fine – chopped peanuts, noodles, carrots, daikon, cucumber, shredded greenleaf lettuce, fish sauce, and the pork. The fish sauce was not my favorite ever but it was fine and legit. I hope I’m not making it sound like I didn’t like the meal – I did. 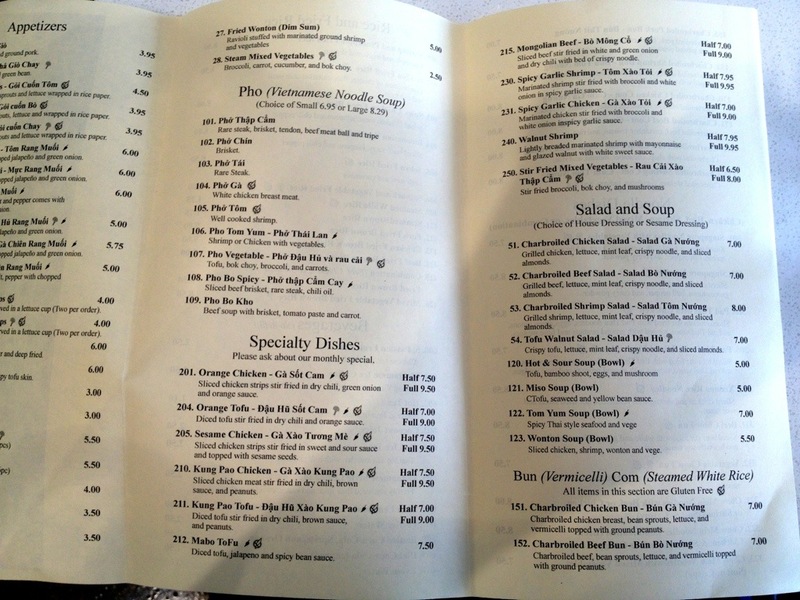 It was decent for legit pho, and really good for the Westside. 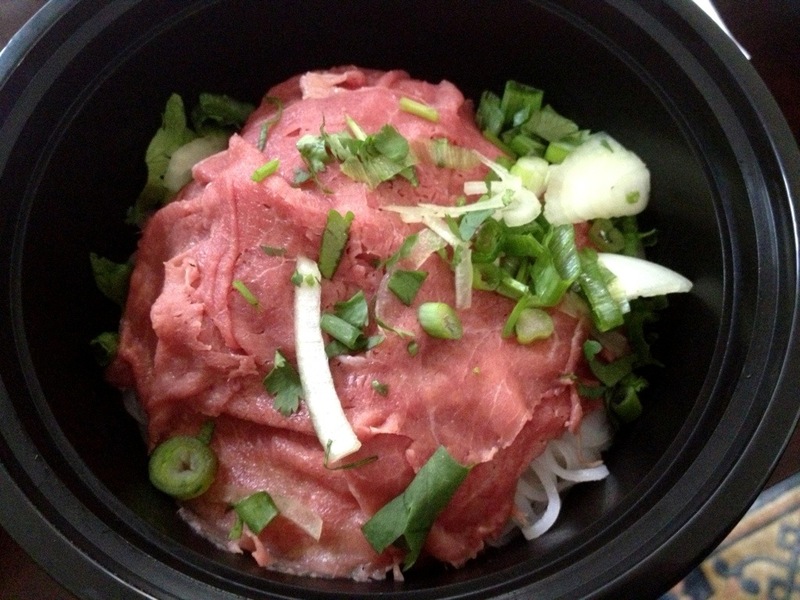 It’s at least as good as Pho Show down the road, and I like it better than Nongla. It’s $7-$8 , which is crazy expensive for Westminster, but fine for the Westside. Hopefully, they’ll drop the orange chicken and double down on continuing to improve the Vietnamese food. I’ll be back.